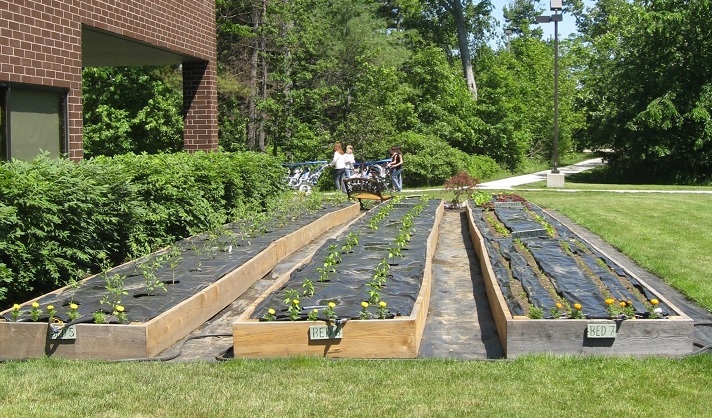 In its first year, Timberland’s Victory Garden featured raised beds made of rough cut hemlock, and successfully engaged employees to use volunteer hours and raise money for the New Hampshire Food Bank with the sale of the harvest. 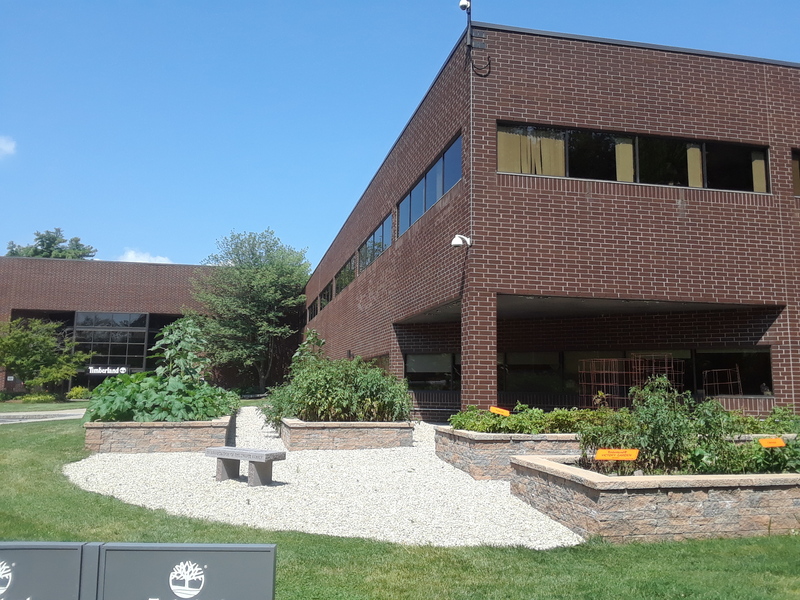 The Victory Garden is prominently placed near the entrance to Timberland’s Stratham, New Hampshire headquarters. Visitors park their cars and walk past beds of tomatoes, summer squash and eggplant (among other crops) to enter the building. Timberland is also home to Bright Horizons, an on-site daycare center. The garden is a special attraction to the kids, many of whom have never seen how vegetables grow. In 2015 the company made a major investment in the garden’s structure and replaced the wooden beds with sturdy stone and granite beds. At Timberland, serving the community is part of our everyday lives – and part of our landscape. As an outdoor lifestyle company, we’re not only passionate about making our products responsibly, but we’re also focused on protecting and restoring the outdoors in the communities where we live, work, and explore. One way this passion comes to life is through our Victory Garden, located outside Timberland’s global headquarters in Stratham, New Hampshire. In 2008 Jeff Swartz, our CEO at the time, decided he would rather look out his office window and see a community garden than hear the lawnmower. So he asked the Corporate Social Responsibility team to lead an effort to make it happen. The team invited employees to join a committee to bring the Victory Garden to life, and by springtime, Jeff’s vision became a reality. When it first launched, the garden was a collection of wooden raised beds that were constructed, filled, planted, and tended to by employees who used their Path of Service™ volunteer hours -- paid time Timberland offers employees to serve in their communities. These volunteers harvested the garden and sold the produce inside the building to other employees. The Victory Garden committee donated all proceeds raised to the New Hampshire Food Bank. Employees were excited to buy fresh produce that was grown by their peers, and to know that their donations supported families in need in New Hampshire. The garden proved to be a popular and flexible way for employees to use their Path of Service™ hours, as employees could volunteer right outside the front door for as little as 1-2 hours each week. In 2010, the Victory Garden expanded with fruit trees and blueberry bushes, yielding pears, peaches, apples, plums and blueberries along with the typical summer crops. This led to more fresh options for employees, as well as greater donations to the food bank. As the years passed and the original wooden beds aged, Timberland made a significant investment in 2015 to create a solid infrastructure for the garden in granite beds in a graveled area. This investment is a testament to the company’s commitment to serve in our communities, as well as the pride the employees have in the garden. To date, donations raised through Timberland’s Victory Garden have tallied over $12,000 for the New Hampshire Food Bank. This year, to celebrate our 10th season with the Victory Garden, Timberland’s donations from the garden will support a new beneficiary. By the end of October, we aim to increase the average annual dollars raised to $3,600 which would provide a new home to a family in need through Food for the Poor, a nonprofit that serves the poor in the Caribbean and Latin America. On a personal note, I am so proud to work for a company that allows our employees to participate in making a difference in our communities. The garden is a win on so many levels. We are giving employees a chance to use their Path of ServiceTM hours in smaller increments. Our internal community can buy fresh produce on-site, and the money raised goes to helping others less fortunate. But the benefit I am most proud of is that many employees have gone on to start their own gardens at home, with skills learned in the Victory Garden. About the Author: Ann Caron is Timberland’s Social Compliance and Reporting Manager. An experienced gardener and co-owner of a local commercial nursery, Ann was a founding member of the Victory Garden committee and has shepherded the garden’s success for the past 10 years.